Located on the outskirts of Ravenna’s central historic district, Osteria L’Acciuga specializes in fish and seafood served in an informal setting. This recent lunch was fabulous. Italy’s cultural riches have few equals in the world. While it is always fun to visit the big cities, the real joy of exploring all that Italy has to offer lies in the provincial towns, far away from the hordes of tourists that flock to the better-known destinations. It is here, in Italy’s small and medium sized cities, where visitors can get a more authentic view of day-to-day life and also discover many of the Italian traditions ranging from food and wine to music and the performing arts, to an assortment of crafts such as shoemaking that have nearly been made obsolete by globalization. Ravenna lies in Emilia-Romagna, arguably Italy’s most famous region for gustatory delights. Many of Emilia-Romagna’s cities are know for their rich culinary traditions, including Bologna, Modena and Parma. On the wine front, Lambrusco, Emilia-Romagna's still sparkling red wine, is going through an especially brilliant phase as an increasing number of producers focus on quality. Beachgoers and lovers of the nightlife flock to Rimini, Riccione and Milano Marittima, especially during the summer, when getting around is next to impossible. Busseto, Faenza, Imola and Ferrara are all steeped in tradition. And then there are the car and motorcycle titans – Ferrari, Maserati, Lamborghini and Ducati – all of which are based in Emilia-Romagna. 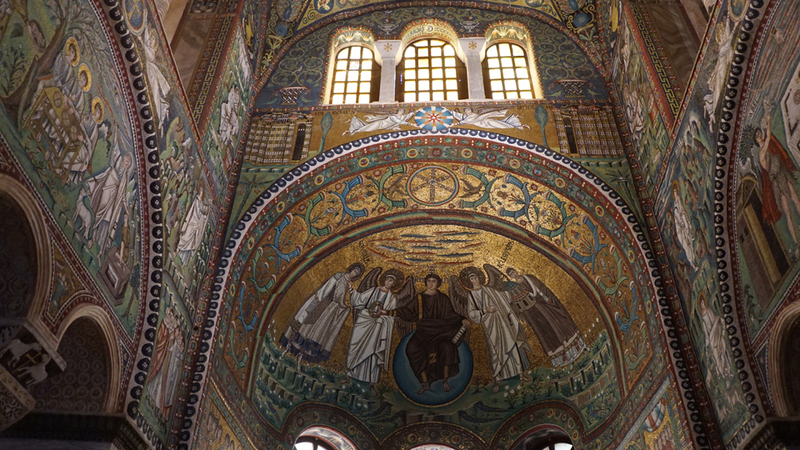 A UNESCO world heritage site, the small town of Ravenna is known mostly for its stunning, well-preserved Roman and Byzantine mosaics. There is a good bit of tourism in Ravenna, but nothing like visitors will see in the big art cities. Much of the town center is a pedestrian only zone that is a joy to explore. Osteria L’Acciuga is a short walk from the city center. Chef/owner Matteo Salbaroli’s menu features a range of delicious, simply prepared dishes that represent the best of the Italian kitchen in their simplicity and ingredient-driven focus. We opted for the day’s tasting menu (€42.00), which was terrific. 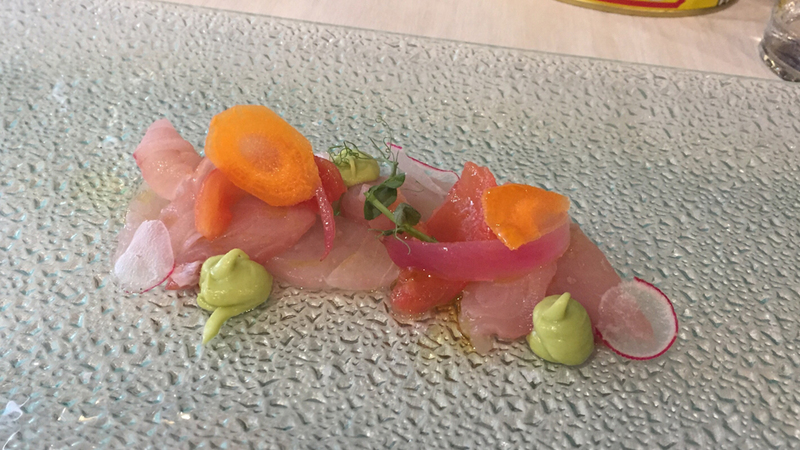 The amberjack carpaccio was light, flavorful and the perfect appetizer for a warm, muggy summer day. 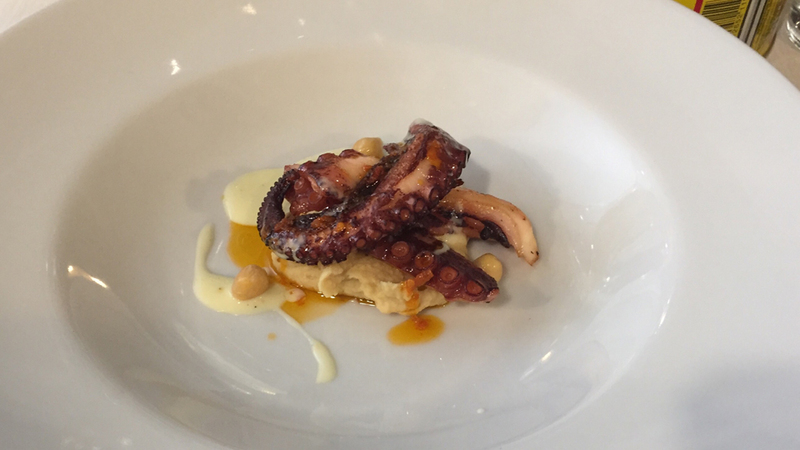 Salbaroli’s grilled octopus was tender and very nicely matched by chick pea hummus. Zucchini flowers are one of my very favorite Italian summer foods. The season is short, so I never miss an opportunity to order them. L’Acciuga’s version was light, airy and delicious. 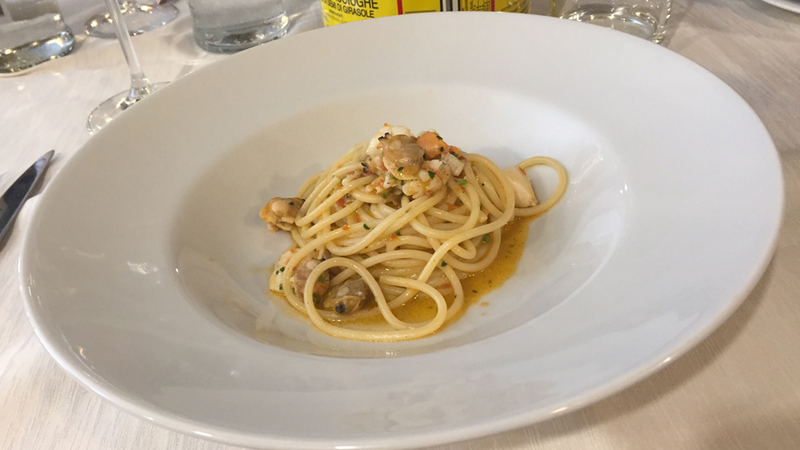 I also enjoyed the spaghetti with scallops, mussels, shrimp and clams, a coastal Italian class. The turbot main course was good, but not as exceptional as the other dishes. L’Acciuga’s wine list is simple, with just enough choices to be interesting. To be honest, with food like this, all I want is a refreshing, quaffable Italian white. 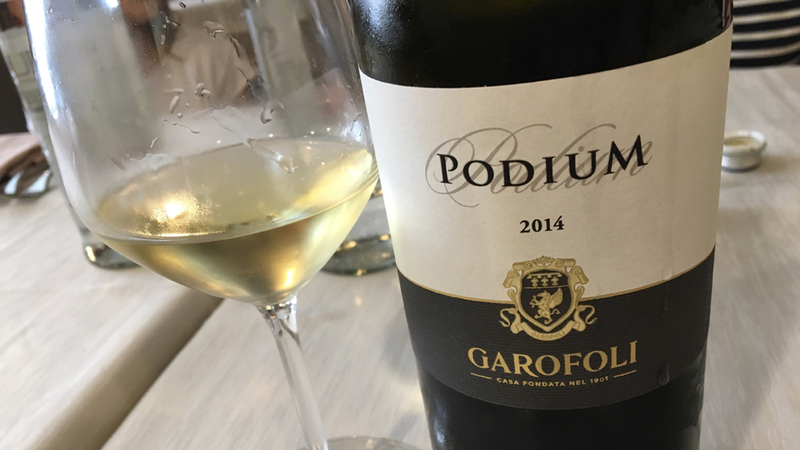 The 2014 Verdicchio dei Castelli di Jesi Classico Superiore Podium from Garofoli was bright and lively but also had a good bit of texture gained from the decision to pick on the later side and age the wine on its lees. We happily went through several bottles over a leisurely lunch that turned out to be a fabulous celebration of several birthdays in the family.